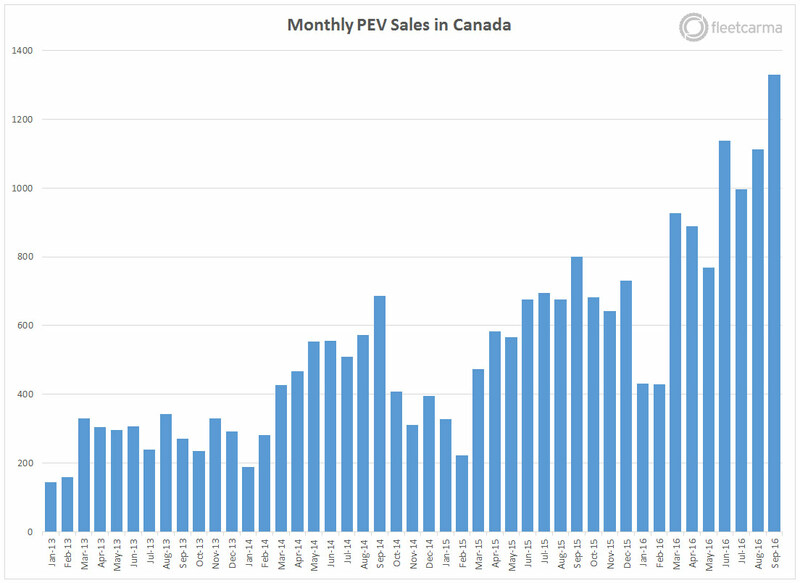 Feb 2017 update: The final 2016 Canadian EV sales numbers are out! The numbers are in – and it’s an exciting time for Canada. We publish EV sales updates along with other industry trends and helpful best practices. You can subscribe to our newsletter so that you’re always kept up to date. After evaluating the year-over-year numbers, it is clear that Ontario’s and Quebec’s growth contributed greatly to the overall national numbers. Quebec crushed it in Q3, showing a 69% growth rate. It had over 650 plug-ins registered in September alone! Ontario also posted a whopping 77% growth rate in Q3. BC showed a bump, but not quite as strong as the other two provinces. This is likely due to the fact that one year ago BC was riding a strong high from the return of the Clean Energy Vehicle for BC incentive. Overall, looking at 2016 (up to the end of September), national growth is up 60% compared to 2015. That’s incredible growth and no doubt a step in the right direction for Canada. While the rest of the provinces aren’t doing much in the line of EV adoption, Quebec, Ontario, and British Columbia prove to be breaking and making records in growth in 2016. With a giant spike in the market, the Chevrolet Volt has dominated EV sales in Canada. In both August and September, the Volt recorded over 450 sales, doubling the sales of the second highest volume PEV (the Tesla Model X) over that period. Nissan LEAF and Tesla Model S sales continue to remain strong, as they are both sitting at 18% of the registered EVs in Canada as of September 30, 2016. With the top 3 EV models holding their ground in Canada, BMW is also taking charge in a new way (pun intended). The BMW 330e is now in the mix of EVs in Canada – the first one delivered in June. As well, the BMW X5 PHEV had flown under our radar, with the first one being registered in January. This makes BMW the retailer with the most plug-in models available in Canada, now with 4 unique models. If you have any questions/comments, please don’t hesitate to give us a shout or leave a comment. And if you want to be notified as soon as new updates are published simply enter your name and email in the subscription box down below!